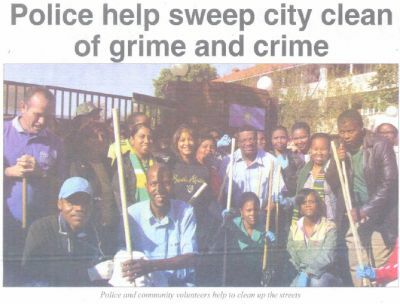 Before you get the wrong impression…..
Police officers from the Pietermaritzburg Central Police station joined forces with local business to clean up Ndlovu Street. Thomas representing Master Builders KwaZulu-Natal, took to the street broom in hand and did the Association proud. The article informs us that the big clean-up was orchestrated by Major General Maharaj following an appeal from both the Mayor and Provincial Government during the launch of the “Friends of the City” campaign where civic pride was the theme of the day. For those who may never have had the privilege, Thomas is the tall gentleman first on the left proudly sporting the blue Master Builders KwaZulu Natal branded golf shirt. Well Done to Thomas for setting a great example!!! !